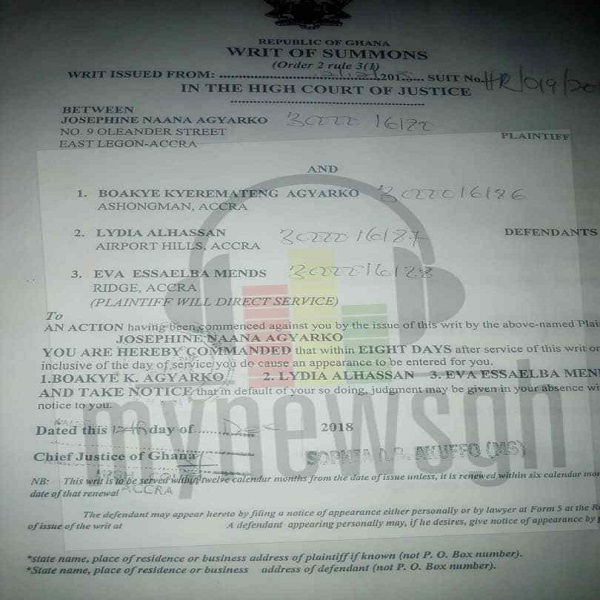 The first wife of the late Member of Parliament (MP) for Ayawaso West Wuogon Constituency in the Greater Accra Region, Josephine Naana Agyarko has dragged elder brother of the deceased, Boakye Kyeremanten Agyarko and her two rivals, Lydia Alhassan and Eva Essabaela Mends before an Accra High Court, MyNewsGh.com can confirm. According to the writ of summons dated December 12, 2018, she stated that her marriage with the former lawmaker was blessed with two children indicating that after the death of her husband the defendants have conducted themselves in ways that are meant to deny her the due recognition as the widow of the deceased and an opportunity to grieve and mourn the loss of her husband. The case is, however, will be heard on January 16, 2018, just a week to the burial of the former lawmaker. Emmanuel Kyeremanteng Agyarko in November 2018, died at the Yale Hospital in the USA after his family authorized the pulling off of his life support, a scenario widely called euthanasia or ‘mercy killing’ by experts. Euthanasia or “mercy killing” is an easy or painless death or the intentional ending of the life of a person suffering from an incurable or painful disease or injury at his or her request or sometimes by the request of his family. He narrated how medical officers at Yale University Hospital tried to treat his brother’s condition to no avail.